Hello my dear friends! Today's post was the last photoshoot I did while we were in Japan this past March, however, it is my favorite and one of the most anticipated one of the trip. 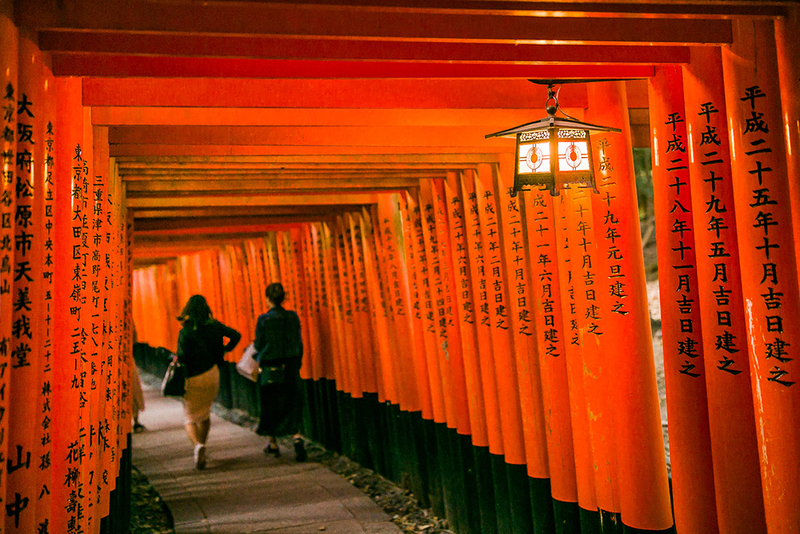 The Senbon Torri (wish gates) at Fushimi Inari-Taisha is a very well-know landmark of Kyoto, not only it is great-takingly beautiful, it also has a deep meaning because each gate carries a wish that is either realized or hoped to be. When I was planning my outfit for this landmark, I was envisioning myself walking through all these wishes, past and present, I would be with them and within them. My outfit needs to be as structured, simple yet striking like these gates. Eventually I paired a crisp white cotton shirt with ballon sleeves with a draped skirt that shaped like a tulip upside down. The accomplished silhouette is strikingly similar to that of a traditional samurai outfit, even the white Mary Jane pumps I picked reminded me of the Japanese Geta (flipflop). I added a belt of big velvet flower and went with a clutch says Jadior (love), because I prefer to realize my dreams with beautiful believes and guard them with love. Thank you so much for reading! There will be a couple more posts from our trip to Japan, please feel free to ask if you have any questions in regard to travel in Japan.